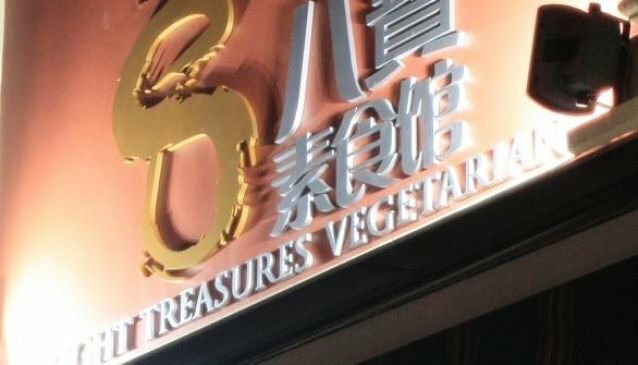 Eight Treasures Vegetarian Restaurant offers a nice and elegant dining option in Chinatown after a visit to the Buddha Tooth Relic Temple. You can enjoy here a traditional vegetarian Chinese cuisine at a moderate price. When you'll be seated, as in many traditional Chinese restaurant, you'll be offered some tea and peanuts to nibble. Don't be surprise if they are charged as it is the custom in many traditional Chinese reataurants.Then choose from the rich menu that will even please non vegetarian guests. Some popular dishes include the 8 Treasures Herbal Soup and Ginseng Mock Chicken Soup, the Sharkfsfish Soup, Black Pepper Mock Chicken Chop and the Buddha Jump Over the Wall.